Everyone these days is looking for healthy snacks that are not only easy to grab on the go and eat, but also affordable. The stores sell lots of prepackaged snacks, but not only are they pricey, but they also usually contain many things we should probably leave out of our diets, including excess sugars and sodium. It seems the healthier the snacks get, the higher the price. A great way to combat this is by making your own healthy snacks – they can always be on hand and you know exactly what goes into them. You can also adjust the ingredients so they are just what you and your family like. 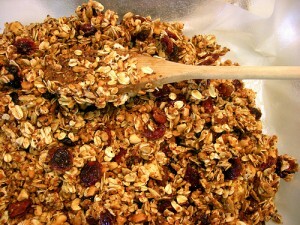 Here is a recipe for granola – the perfect snack to take on the go. Often store bought granola can be expensive and quite high in fat and sugar. This one will astound you with its ease to make and great flavor. Heat oven to 350 degrees and spray a baking pan with non stick spray. Mix the oats, coconut, nuts and dried fruit together in a large bowl. Add the cinnamon; toss to distribute. Pour the maple syrup on the mixture and mix with a wooden spoon until evenly coated. Pour the granola mixture onto the prepared pan and spread evenly with the back of the spoon. This is not the type of granola that will stick together, but it does need to be even in the pan. Bake for ten minutes and then take the pan out of the oven, toss the granola, smooth out again and bake for another ten minutes or until it is evenly and lightly browned. Let the granola cool and it is ready to go. It can be nicely sealed in glass mason jars and can keep for a couple of weeks. This is delicious not only on its own as a snack, but also served with milk like cereal for breakfast or mixed with any flavor yogurt and some fresh fruit. It also makes quite a nice gift. Just tie a rustic ribbon around the jar, include the recipe if you want and you have a homemade, inexpensive gift ready to give. The only problem may be that your recipient keeps asking for more!